With the emphasis on recycling these days, plenty of designers and artists have come up with ingenius ways to turn waste into something beautiful. 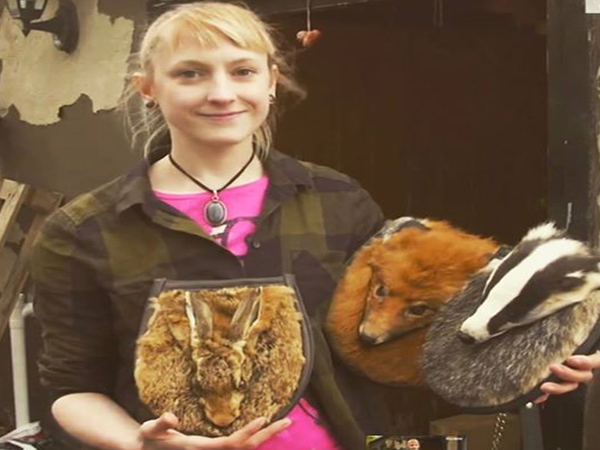 But one such designer from Aberdeenshire in Scotland has taken this trend to the next level by creating handbags out of the remains of dead animals she finds on the roadside. “I started taxidermy in October,” Emma Willats told YOU via email. Her boyfriend was also in a car accident shortly after she took up taxidermy so she needed to make a plan to generate extra income so that she could look after him, explains Emma. “I started sporran making in February last year”. Sporran are the little bags worn on the front of traditional Scottish kilts. She called her business The Dapper Dead Taxidermy Sporrans. Sporran is the Gaelic word for “purse”. Emma, a vegan, says she doesn’t see anything wrong with using animal remains to manufacture the sporran. It takes roughly a week to process the hide and another week to dry it out. Then it takes about four hours to make the bag using the skin and fur, she explains. Despite the fact that some vegans criticise her and call her designs gruesome, Emma admits that their opinions don’t bother her much.